Members of the Real Affordability for All Coalition announce their new report on the steps of City Hall, September 14, 2017. Criticism of Mayor Bill de Blasio’s housing strategy from both residents and Democratic challengers did not stop the mayor from winning by a wide margin in Tuesday’s primary. But that doesn’t mean concerned constituents are sitting tight. 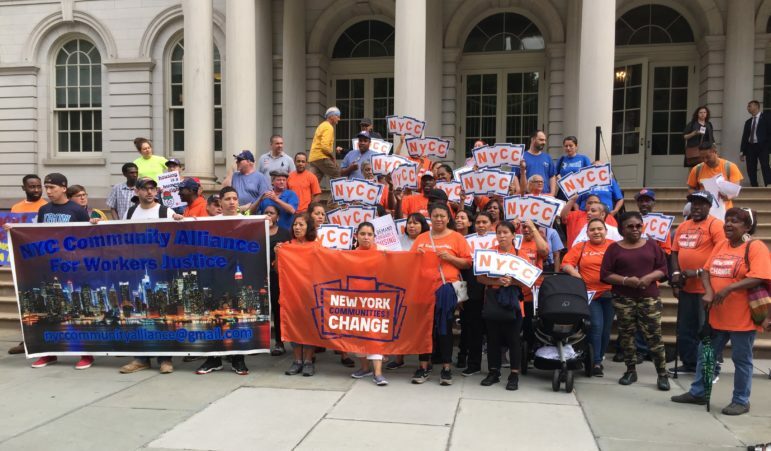 On Thursday morning, affordability advocates gathered on the steps of City Hall to denounce what they say is the worsening of the affordability crisis under de Blasio—just before members of the City Council pressed the administration to tweak the housing initiative to better serve low-income New Yorkers. With de Blasio “expected to coast to re-election victory,” the members of the Real Affordability for All coalition (RAFA) are “wasting no time pushing him to make changes to his housing plan” with the release of a “damning new report” a press release said. The press conference was timed to coincide with a Council Committee on Housing and Buildings oversight hearing on the Department of Housing Preservation and Development (HPD)’s updated subsidy programs, where members of the Council pressed the agency for details on how the administration is assisting the lowest income households. RAFA is an alliance that formed at the beginning of the de Blasio era to advocate for affordable housing and union jobs. Last year, the group fought to make changes to the administration’s proposed mandatory inclusionary housing (MIH) policy, then agreed to work with the administration on a follow-up study about some of their proposed recommendations to reach deeper affordability levels and increased wage restrictions. The study ultimately commissioned by the de Blasio administration, however, was short and dismissive of RAFA’s suggestions. The new RAFA report, which can be read here, has been endorsed by 10 groups, including Tenants & Neighbors, New York Communities for Change, Urban Homesteading Assistance Board and others. It recognizes some successes under the de Blasio administration: the passage of right to counsel for tenants in housing court and the decision to dedicate more units in the plan to households making less than 50 percent Area Median Income ($42,950 for a family of three). But it ultimately condemns the administration’s “fixation” on building or preserving 200,000 units and argues that the mayor is still not creating enough housing for the lowest-income brackets, thereby fueling the homelessness crisis. RAFA calls for more units for low-income and moderate-income bands. The report highlights the fact that there have almost been as many units created for families making between 121 and 165 percent Area Median Income ($103,081 to $141,735 for a family of three) as there have been for the families most at risk of homelessness: those making less than 30 percent AMI ($25,770 for a family of three). The de Blasio administration often counters that the middle-class needs affordable housing too, but RAFA argues that the middle class is not nearly as strapped: Families making 30 percent AMI can afford roughly 6 percent of available apartments in the market and households at 120 percent AMI can afford almost 70 percent of available apartments on the market, the report states. The coalition takes particular issue with housing developments and rezonings in low-income neighborhoods where much of the “affordable” housing would not be targeted to the lowest incomes. The report says that the mayor has issued 19 Requests for Proposals (RFPs) to develop public land in his first term—way up from Bloomberg, who issued 35 in 12 years. This could arguably be seen as a confirmation of the de Blasio administration’s stance that it is indeed taking action to develop city-owned parcels for the public good, but RAFA says the administration is not getting enough benefits out of each project and should require that public land be developed by non-profit developers with 100 percent affordable housing. It further argues that the administration could do more to ensure homeless New Yorkers immediately return to housing, including making rental assistance vouchers permanent and requiring that the vouchers, instead of offering a set amount of assistance, pay up to the given apartment’s fair market rent, like section 8 vouchers. It also urges the administration to use all possible tools to protect existing tenants from displacement and criticizes the mayor’s efforts to convert buildings that are cluster sites (where landlords are paid to house the homeless in private apartments) to shelters, as reported by Gothamist. RAFA says those sites should instead be turned into permanently affordable and rent-stabilized housing. The city, for its part, has argued in the past that it’s already making a serious effort to protect existing tenants, including investing funds to address NYCHA’s repair problems, launching the Tenant Harassment Prevention Task Force, and making new efforts to increase landlords’ participation in HPD’s affordability programs, among many other efforts. The City Council also just passed multiple tenant protection bills that relate to some of RAFA’s concerns. Meanwhile in the City Council Chambers, HPD explained the recent changes it has made to a few of its termsheets for the construction and preservation of subsidized, affordable housing. The changes were made to accommodate the administration’s decision, announced in February, to target more of the 200,000 total units in the plan to families making below 50 percent AMI ($42,950 for a family of three). The percentage of units for that bracket increased from 20 percent to 25 percent, and as of July about 32 percent of units actually created or preserved were for those brackets. Changes were also made to ensure all new construction projects under the city’s two main termsheets—the ELLA and Mix and Match programs—are required to provide a portion of units for homeless families. The city also codified in the termsheets that developers that are in upzoned areas where the city’s mandatory inclusionary housing rule applies and which want to use subsidy for those mandatory inclusionary units will be required to commit to permanent affordability for another 15 percent of units. That means that instead of 25 percent of the units being “permanent” and the rest of the units being subject to expiration dates, 40 percent will be permanently affordable. “The City explicitly did not intend to contribute funds that might subsidize MIH units, and so we had to establish a policy for affordable housing projects that go well beyond MIH affordability but which are also subject to MIH requirements,” said deputy commissioner Molly Park. The city also made changes to ensure that developers don’t always choose a program option under ELLA that includes 30 percent of units for the homeless (which the city subsidizes at a higher rate) but no housing for non-homeless families in the lowest income brackets. The city is boosting the subsidy amount for the option under ELLA that includes both homeless units and low-income housing. Subsidy levels were also boosted to keep up with the cost of construction, but projects that request even more subsidy will be required to provide more affordable units. Jumanne Williams, chair of the Committee on Housing and Buildings, thanked HPD for its efforts to ensure the affordable housing plan reached more lower income families, but emphasized that he believed the administration could still do better. He said he wants to revisit the city’s mandatory inclusionary housing program to require more units for lower-income families and that he’ll continue pushing the city to make further chances to its termsheets. He also asked HPD if they were going to put community land trusts in their housing plan. Park said that they were always open to changes, but stressed that requiring more low-income units through mandatory inclusionary housing would likely require a tradeoff, like less income-targeted units overall. She also noted that even though only 25 percent of the mayor’s 200,000 unit target are for families making in the lower income brackets, that the mayor’s investment in NYCHA and in rental subsidies for very low-income families are not counted toward the 200,000 unit target. She further said that it was important to have some middle-income units in subsidy termsheets because those can help ensure the long-term sustainability and maintenance of the building. The NYC taxpayer will be on the hook for all this. What no one is talking about is the number of working tenants making $50K+ who fall into the limbo of making too much or too little for NYC’s “affordable” housing lottery apartments. There should be zero affordable housing bands for household incomes above $65,000. At that income level most NYC apts are affordable. Especially in this real estate landscape gentrification inspired rooming houses and room mates. There are many working, middle class, single moms with children households that have been evicted and displaced because the insane new “market rate” for Brooklyn (areas previously undesired by current gentrifying segments) has outpaced their income. This is the segment of homeless (now staying with family or friends) NO ONE talks about. What about us? As a member of CB5 and longtime resident of Brooklyn, I was actively involved in the think tanks that looked to extract benefits from the people’s land giveaway to developers and investor organizations. For the sake of not regurgitating false narratives let me just say this, The only way to provide “Sustainable Housing” for the working class with an upward mobility to homeownership is a partnership between the City, State, and Federal government. If I know that then the Mayor, HUD and reporters should know it as well. The most successful model of Sustainable, MIH in the country is right here in NYC, Mitchell Llama and the Nehemiah homeownership program. I can refer you to city council hearing where I gave testimony and no council member could identify where it was. Yet, they still chase the false narrative about providing “affordable” housing. The deBlasio admin is uncertain about home ownership. To deBlasio and the progressives way of thinking the poor and renters are an endless source of votes and dependency on government regulation. Home owners provide needed (and ever increasing) property taxes. Home owners also provide stability for neighborhoods but that’s not deBlasio’s concern. He’s not really interested in maintaining quiet stable neighborhoods. Home owners demand services like safe schools, active policing and well-maintained streets, things that the city isn’t interested in under deBlasio. Some in the deBlasio admin would zone 1 & 2 family home areas out of existence. The Department of City Planning has made some small modifications, but continues to insist on the original density levels and on 25- to 35-story buildings. Rhetoric from a rancorous primary spilled into discussions of the city’s controversial rezoning plan for Inwood.